Immobilization with ketamine which, according to Dr. Suedmeyer, is a safe drug for all ages and species, including humans, and is approved by the FDA for use in primates. Ketamine is administered by injection, or with a dart gun for some species in the zoo setting. Ketamine is sometimes mixed with other drugs to create a “ketamine cocktail” to extend and enhance the effects of ketamine. Immobilization can also be accomplished with inhaled anesthesia using gas. Gas is administered with a mask, a gas chamber such as an aquarium or through an endotracheal tube. Often a combination of ketamine and gas sedation are used; an injection of ketamine to put the animal to sleep and gas to keep the animal sleeping throughout the procedure. Both ketamine and gas are safe for primates, and both have pros and cons. The method used to sedate is largely based upon the veterinarian’s preference and what they are most comfortable using. Blood Testing with a Complete Blood Count (CBC) and Chemistry Profile is done to measure blood glucose levels, kidney function, liver function, iron levels among other things. These tests show a picture of how the organs are functioning and the primate’s overall health. Viral Testing for antibodies to primate viruses. A different test panel is administered to old world monkeys and new world monkeys, as the viruses that they are susceptible to are different. 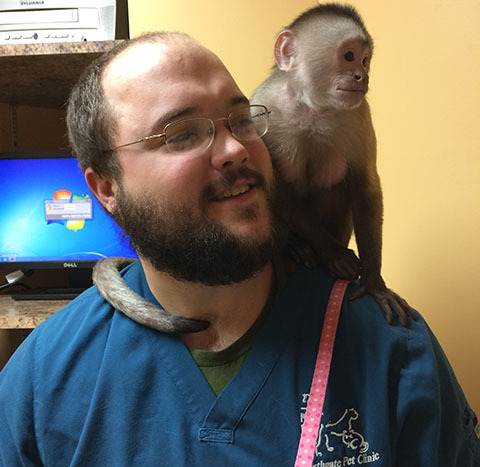 While the KC Zoo administers viral testing panels every other year, our primates in private homes are usually tested only once during their lifetime, and retested only if a suspected exposure has occurred. Primates in private ownership rarely test positive for viruses with the exception of squirrel monkeys that frequently carry Herpes Saimiri, which is fatal to marmosets, tamarins and owl monkeys. TB Testing is administered to the eyelids of the primates at the KC Zoo to facilitate the reading of the test at 24, 36 and 72 hours. Zoo staff can easily examine the injection site simply by looking at the primate’s face. Our companion primates that can be handled may receive the tuberculin test on any hairless skin. A special needle and syringe must be used to administer the test, and the reading at 72 hours is the official documented reading. A skin reaction at the injection site indicates a positive reading. It is extremely rare for a primate to test positive for tuberculosis. A positive reading would likely be followed up by repeat testing and chest x-rays to confirm the diagnosis. Tuberculosis is a highly contagious zoonotic and anthropozoonotic disease, meaning that it can be passed from animals to humans, and from humans to animals. A TB test is often required for a primate to be issued a health certification for interstate travel. Stool Cultures are performed to test for intestinal bacterial infections. Bacteria are present in the intestines of all living creatures and typically co-exist with their host without causing illness. But at times the host animal’s own normal bacteria can grow unchecked and cause illness, as can invading bacteria that are introduced into the intestinal tract through food or other exposure. Signs of bacterial infection are vomiting, diarrhea, loose stool, or a foul-smelling stool. Dental Examination and Cleaning is done every other year on the primates at the KC Zoo. Undiagnosed dental problems such as broken teeth or abscesses can lead to other more serious health problems as well as pain and weight loss. Parasite Control begins with testing the stool for ova and parasites. It is not uncommon for a stool sample to test negative for O&P as these organisms are present in the stool at only certain stages of the parasite’s life cycle. Routine deworming is done, regardless of the outcome of the O&P test. Animals and humans are hosts to various types of organisms. A normally functioning immune system typically keeps these organisms in check so that the host animal’s health is not adversely affected. But various factors can sometimes cause an overgrowth of parasites which can lead to illness in the host animal. Routine preventative deworming helps to keep parasite counts down to a level that the body can manage. Skin Biopsy is done at the KC Zoo to evaluate for genetic abnormalities that could be passed on to offspring as the zoo has an active breeding program and participates in species survival programs with various species. This is not a test that is typically done during a routine physical exam on a primate in private ownership. Body Condition Scoring (BCS) is performed by weighing the primate and examining the body to assess muscle mass and percentage of body fat. A Body Condition Score (BCS) between 1 and 9 is assigned, with a score of 1 being emaciated and 9 being obese. BCS varies from one species to the next as some species have a higher percentage of body fat and/or more muscle mass than others. BCS is based on what is normal for that species. Reproductive Evaluation is used to determine a primate’s reproductive status and potential for breeding. The KC Zoo encourages breeding for conservation and many of the species housed there are participants in species survival programs. Those animals that are not selected for breeding are vasectomized (males) or administered contraceptives (females). Primates in zoo and sanctuary settings are typically not spayed and neutered as not to interfere with normal male-female social behaviors. Dr. Suedmeyer reported that ovarian cysts are frequently seen in female primates that are not allowed to breed, and made the statement that, “Reproduction is preventative health care,” for primates. Most private owners keep their primates for companionship, not for breeding, and typically spay and neuter their primates. Imaging with ultrasound and/or x-rays can bring to light health problems that cannot be diagnosed through testing or other types of examinations. Often healed fractures are found on the x-rays of zoo primates that their keepers never even knew they had sustained. The primates at KC Zoo are x-rayed from head to toe at each of their bi-annual examinations to evaluate for disease as well as to provide a baseline for comparison with future films. Often chest x-rays are performed on our companion primates when they are healthy for the same reason, to provide a baseline of what their normal, healthy chest looks like for comparison in the event that they would develop heart or lung problems. Summary: Using Dr. Suedmeyer’s program of veterinary care for the primates at the Kansas City Zoo as a model, we can discuss our primate’s health care with their own veterinarian and make decisions together about the preventative health care measures they need to keep them healthy for a lifetime that extends well beyond the life expectancy for their species.